There is an industrial-strength air purifier running in the back of the house. The machine fills the room and the adjacent spaces with a ceaseless stage whisper. This is not the harsh, bristling whir of white noise, but the more rooted whoosh of its feminized alternate, pink noise. It is noise, nonetheless. This purifier has sat there for years, retained for the occasional days or even weeks when the neighborhood’s plant allergens are particularly heavy in the air. These days, the air itself is heavy and the purifier is running far more often than usual — once all night by mistake, an industrial-music lullaby on repeat. The air is heavy with particulate fallout from the fires that raged some 175 miles to the northeast of where I live. Today the particulate level — the environmental DEFCON — is registering as red, having nudged up from orange. The color red signifies merely “unhealthy.” Across the bay it has been “very unhealthy,” signified on maps and in advisory alerts by a deep purple. (Cue “Smoke on the Water.”) One level higher is some sort of maroon, meaning “hazardous.” It was deep purple here a few days ago, causing the schools to close, public transportation to be free, and museums to forgo admission fees. If TV is the opiate of the masses, apparently fine art is its vaccine. Home for me is in San Francisco, not far from the ocean and quite close to the park. The fires were in the town of Paradise, California — the sort of geographic marker that would induce groans in a fictional film of our current narrative, and yet one that triggers as surreal in, well, what appears, through the smog, to be real life. There is a second air purifier, borrowed, at the front of the house in the living room, where the windows are of a more recent vintage, but the smell and taste of smoke lingers still. Those pathogens are of external origin. The low-level noise pollution, by contrast, is self-induced. The house is empty at the moment except for me — me and the twin air purifiers. An album of ambient music, recently released, is playing in the kitchen on a small counter-top speaker. It is a newly purchased “dumb” speaker, which is to say it lacks any AI functionality. This speaker connects in the simplest ways to the internet, and it is not part of the so-called internet of things. It does not reply when I speak. It does not ask questions. It merely channels audio from various devices. This is today: We process our air, and we seek out products that lack intelligence, the way we want foods lacking in nitrates, un-tinged by antibiotic overflow, their genetic makeup non-modified — unprocessed, in other words. I was at the bookstore to attend a mid-day concert by a pair of local electronic musicians whose quiet, abstract work often hovered in the realm of white noise. I wondered later if their music had so settled our ears on a subtle palette, that we became, unintentionally, all the more sensitive to intruding noises. The house is full of pink noise, byproduct of air purification. For a moment, I forget music is even playing. This is ambient music, music intended — in Brian Eno’s orienting definition — to be of use both in the background and as the subject of focused attention. The current background, however, is challenging the music’s subtleties — swamping them, frankly. I turn up the volume on the kitchen speaker. I then move to another room. I go back to the kitchen, and turn the speaker up higher, and the music ceases to be the first category of ambient (i.e., background) and does its best to satisfy the demands of the second category (i.e., subject of attention). The kitchen speaker at this volume reveals sharp pitches amid the album’s seemingly placid tones, or perhaps the music’s sharp pitches reveal the speaker’s shortcomings. The device is new, keeping opportunity for comparison is limited. This whole scenario is new, by which I mean the broader environmental issues. Either way, an arms race is underway: the pink noise of domestic infrastructure against the sound design of contemporary popular music. We’ll need new genres of music in our climate-punk future, genres that can conjoin or deflect the presence of the machines that we’ll employ to save us from what our machines have wrought. The sad fact is that the pink noise seems like it should signify quiet on its own, and yet a pummeling inner momentum has risen to to the noise’s surface. There is an evident, anxious churn to the pink noise that is in contrast with the two devices’ purr-like quality. Perhaps the emotional tension is more contextually based: the presence of the noise having brought to mind the need for the device in the first place. The pink noise is a byproduct of a device to clean the air of the byproducts of fire. Distant fires are made more proximate by our need to adjust to their impact. If there is a momentum to the purifiers’ noise, could something offset them? Pink noise, like white noise, serves as a mask for sound. The constant randomness of its myriad scatter-shot audible content — sonic particulate, a parallel to the atmospheric particulate the machines are to cancel out — can reduce the sensed presence of other noises. The churn inherent in the noise has no set tempo, but still implies one. Could something grasp that fungible tempo and render it slower? Could something cancel out further the higher register of the noise, much as pink noise reduces the harsh upper level of white noise? Could something carve music from the pink noise itself? This cultural question is a tiny vestige of a larger discussion underway, a discussion addressing the caustic cycle: industrialization yields environmental consequences, and adjustments are made to counteract or sublimate those consequences, yielding further consequences. The question, of course, is how far one tunes one’s personal environment in light of the environment — the environment environment? — before one has, in effect, tuned out the environment. 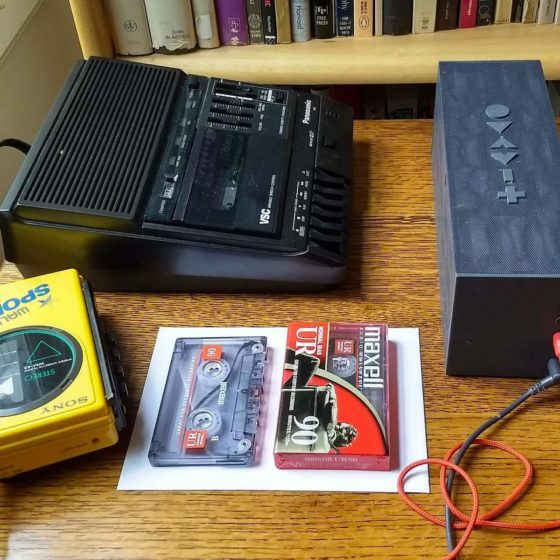 Another little weekend project straight out of any Electronic Music 101 textbook: make a tape loop with an old cassette. I’d never done this before. The cassette tape is from an old batch of unused 90-minute Maxells I have on hand. The loop was recorded on a Panasonic Standard Cassette Transcriber RR-830, a relic of when I’d record interviews on physical cassette and then transcribe from those cassettes. That Panasonic device has a foot pedal, which used to make the start/stop process of transcription a tiny bit more bearable, especially because it can micro-rewind an adjustable amount with each pause. At first I thought the issue with the playback ending on the Panasonic had to do with a poor job on my part constructing the cassette. So, I took it apart and made it more taut by trimming the length of the tape a bit, as well as reinserting the second plastic reel. Still, the Panasonic ceased playing after two or three cycles. To test the newly refined tape loop, I put the cassette in the old, bright yellow Sony “Sports” Walkman, and it played well, over and over and over. Perhaps there’s a setting on the RR-830 that will make it less sensitive, and therefore capable of playing the loop on repeat dependably. Making the loop was more painstaking a process than I’d expected, even after advance warnings from various experienced people. The standard cassette tape has loose parts, held in only thanks to the tension supplied by five tiny screws. In addition, getting the tape to the correct length, and connecting it into one continuous piece, requires a level of dexterity almost — but, fortunately, not quite — beyond my manual dexterity. I got it to work, which was a lot of fun in the end. The sound quality is excellent, which is to say it is rich with texture, not high-fidelity. And if you want to try it out, the tape-oriented musician who goes by the name Amulets has a helpful video on YouTube. There’s also a good tutorial at instructables.com.